Advising leaders on communicating effectively to elevate professional relationships and improve business outcomes. Working individually with Jennifer, you build executive presence and reach your immediate leadership goals. Teams increase performance as Jennifer observes dynamics, facilitates discussions, and provides actionable strategies. Participants practice new skills as Jennifer adapts content and activities to meet organizational needs. Click here to watch more videos on how Jennifer's clients have benefited from coaching and workshops. Hold a room, be at ease, build connections, and garner respect. Take responsibility for better business relationships and outcomes by elevating quality communication. Manage the content, time, and relationships in meetings in order to maximize value. Cultivate team spirit and performance by knowing and leveraging individual strengths. Be fully present and aware of self and others to improve interactions and make better decisions. Define a clear narrative and engage your audience with visually compelling slides. Project confidence while getting the right message across in an engaging manner. Excel in tough times with preparation, timeliness, consistency, and mindfulness. Meet the needs of the media while reinforcing your organization’s brand and being quotable. Evaluate how tech is helping/hurting your communication; take control for more efficiency with less stress. 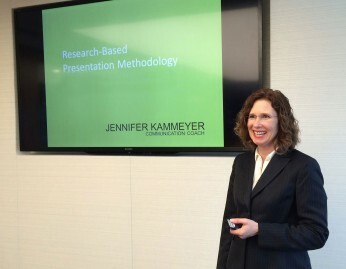 Jennifer Kammeyer, M.A. Communication, applies over twenty five years of experience helping leaders improve their reputations and their businesses through effective communication. She offers her guidance for executives 1:1, for teams, and through workshops. Companies work with Jennifer to improve critical communication for elevating leadership, improving team performance, and launching new endeavors. Jennifer advises leaders and conducts workshops on all aspects of professional communication. Popular topics include building executive presence, public speaking, high-value meetings, team building, conflict resolution, technostress reduction, and mindful communication. She also teaches Leadership Communication and other courses at San Francisco State University, has conducted empirical research on effective presentations, and has authored a textbook chapter, entitled Presenting with Technology, in Human Communication in Society, (3rd ed. ).